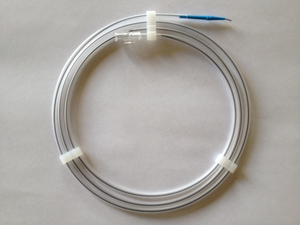 The Dextronix Nitinol guide wires with soft and atraumatic tip are excellent for ureteral stent placement. Nitinol as the material of choice provides superior elasticity, prevents kinking and is very twist proof. The hydrophilic coating of the wires assures very high gliding ability. Available with straight tip or J-angled tip minimizing the risk of perforation. Every set includes one guide wire and dispenser, supplied sterile, for single use only. PTFE coated Spiral Mandrin guide wires in various lengths and diameters are also available on request.